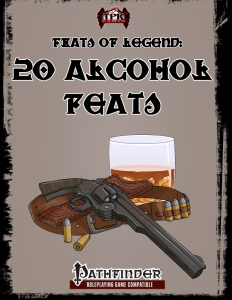 This installment of the Feats of Legend-series clocks in at 6 pages, 1 page front cover, 1 page editorial, 1 page SRD, leaving us with 3 pages of content, so let’s take a look! -Falling Down Drunk: Reduce falling damage by 10 ft. per alcoholic drink you consumed in the past hour. -Drink Like A Demon: Requires Con 13+; lets you drink a potion, drink, etc. as a move action that does not provoke AoOs. -Down the Hatch: Requires Drink Like A Demon. Lets you draw a potion or bottle from a holster, bandolier, etc. as a free action. -Firebreather: Requires the previous two feats; as a standard action that provokes AoOs, you can take a drink and spit it through a torch, generating a 15-foot-cone of fire for 1d6 fire damage, with a Ref-save of 10 + ½ character level + Con-mod as a DC to halve. Breathing through a flaming weapon increases the DC by enhancement bonus, base damage to 2d6. Flaming burst weapons upgrade that to 4d6 and increase the save DC by enhancement bonus +2. Really creative take on the old trope. Kudos. -One More Round: Requires Diehard and Con 13+ (misspelled as Die Hard); when dropped below 0 hp and you had a drink in the last hour, you can choose to be sickened instead of staggered. -Hollow Leg: Requires Con 13+; lets you drink 1 + thrice your Con-modifier drinks. When you drink more, you’re sickened for 10 minutes per drink, rather than 1 hour. -Drunken Brawler: Nets you DR 5/- against nonlethal damage if you had a drink in the last hour. -Fortune Favors the Drunk: Beyond Hollow Leg, also requires that you worship an appropriate deity. Nets you +2 to a save of your choice if you had a drink in the past hour. Taking a new drink allows you to switch the save. -In Wine, Truth: Nets you +2 insight bonus to saves versus illusions. 1/day when failing a save against an illusion, you may disregard it as though you succeeded as long as you had a drink in the past hour. Afterwards, you’re sickened for 1d4 rounds, though. -Mean Drunk: +2 melee and natural attack damage while sickened. -Good For What Ails You: +2 (untyped) bonus to Fort-saves if you had a drink within 1 hour. 1/day, when failing a Fort-save, you may reroll it as an immediate action. On a success, you’re sickened for 1d4 rounds. Weirdly, not on a failure. -Cast Iron Stomach: Requires Good For What Ails You; if you have drunk a drink in the past hour, you’re immune to the nauseated condition and instead become sickened. -Can’t Feel A Thing: Requires One More Round and Drunken Brawler: Upgrades DR versus nonlethal damage to DR 10/- and also nets DR 5/- versus slashing or piercing damage, both contingent on having a drink within the past hour. -Liquid Courage: Requires Hollow Leg and Good For What Ails You: +2 to saves versus fear effects after imbibing a drink; 1/day when failing a save versus a fear effect, ignore it while the bonus is in effect. -Poison Chaser: Requires Hollow Leg and Drink Like A Demon; when failing a save versus a poison, you may imbibe alcohol as an immediate action to reroll the save. On a success, you’re sickened for 1d4 rounds, but negate the poison. You don’t have to have the drink in your hand. -Glass Hammer: Requires Catch Off-Guard; increases damage with bottles or glass mugs to 1d8; when hitting a foe with a broken container, you may choose to blind the target for 1d4 rounds. You can break containers as a swift action. This one imho should not be limited to glass – glass was rare and costly in earlier ages and must tankards were not made of glass. -Intoxicated Evoker: Lets you consume a drink as part of casting an evocation spell for + 1 CL. -Staggering Drunk: +1 dodge bonus to AC and +1 dodge bonus to Ref-saves if you have consumed a drink during the last hour. -Wind of the Divine: As Intoxicated evoker, but applies to divine healing spells instead. -Words of Wine: +2 to Diplomacy if you had a drink in the past hour. Srsly? Editing and formatting are good, I noticed no grievous glitches on a formal and rules-language level. Layout adheres to a 2-column full-color standard with a used-parchment-style background. The pdf sports two nice full-color artworks. The pdf comes fully bookmarked, in spite of its brevity – kudos! Neal Litherland’s alcohol feats make one thing clear: It doesn’t pay to be a drunk, not even in a fantasy world. Froma design-perspective, there is a lot to like here: The floating bonuses, emphasis on player agenda and choices etc. makes for some fun decisions. Here’s the problem: The cool ones are locked behind a feat tax and their benefits are not enough to warrant taking them, not even in the most gritty, low fantasy game I’d run. (And you all know how I gravitate to grittier playstyles!) Some of them are almost insulting. +2 to Diplomacy when you’ve had a drink within 1 round. That’s even weak for a trait, much less a feat! And then it struck me: The cool-down mechanic that’s a feat with its cap; the follow-up abilities…this looks like an archetype that has been disassembled and jammed into the guise of feats. The small bonuses, the limiting sequence – a large part of the feats herein needs one another to properly work, but doesn’t yield enough benefit to warrant wasting the feat tax on them, which would at least make that thesis seem plausible. This is not a bad supplement from an engine-perspective, mind you – if you’re looking for ultra-gritty, low-powered options, this may do something for you. But not even for flavor-purposes would any of my players even contemplate taking the feats herein. Alas, this means I can’t go higher than 2 stars on this one.